• Why do I need health insurance? • How can I get health insurance? • Is the Ryan White HIV/AIDS Program insurance? • How do I enroll in Marketplace insurance or Medicaid coverage? • What do I do after I enroll in a Marketplace health plan? • How do I know what doctor to go to? How much will my doctor visit cost? • I’m under 26 and on my parents’ health insurance plan. How can I get care without them knowing I have HIV? 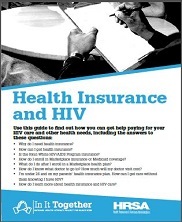 • How do I learn more about health insurance and HIV care?